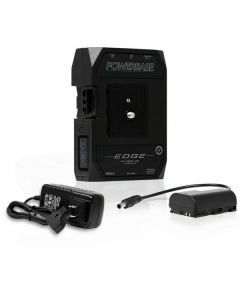 The follow-up to the highly successful Powerbase70, the Powerbase Edge is a feature-rich "small-form" Cine and DSLR pack, in a v-mount form. The 14.8v Lithium Ion pack includes one 8v port to power various cameras, two USB output, and two power tap outputs, one of which being a SmartTap. Includes PB70-C15 charger and battery cable for the BMD Pocket 4K. Size: 5.1" x 3.6" x 1.55"